A common claim from economic and stock market observers is that a rising trade deficit is injurious to the economy -- hence, bearish for stocks. On the other hand, a falling trade deficit is commonly believed to be bullish for stocks. For example, on March 27, CNBC reported, "The U.S. trade deficit fell much more than expected in January to $51.15 billion, from a forecast $57 billion. The decline of 14.6 percent represented the sharpest drop since March 2018... ." Yet on the day the news was released, the main U.S. stock indexes closed lower. 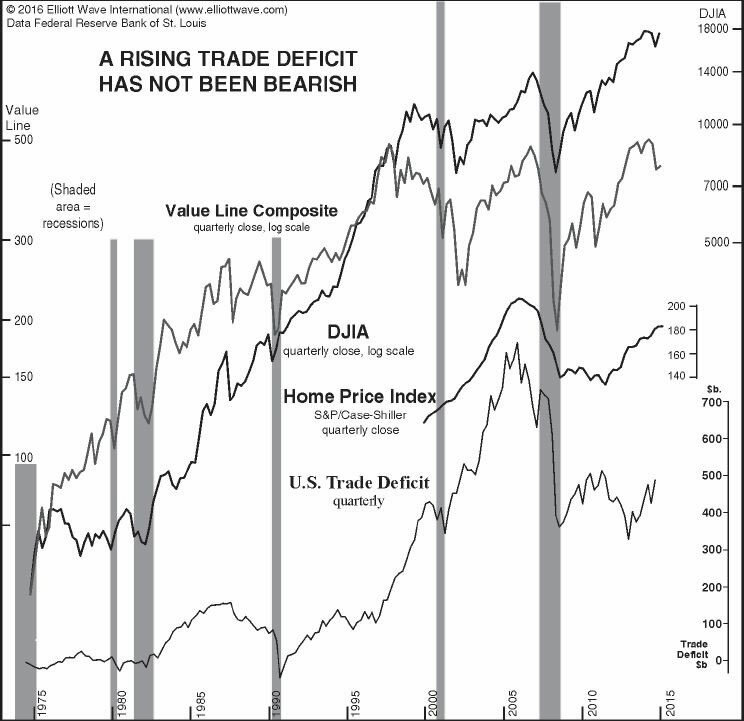 The chart reveals that had economists reversed their statements and expressed relief whenever the trade deficit began to expand and concern whenever it began to shrink, they would have quite accurately negotiated the ups and downs of the stock market and the economy over the past 40 years. The relationship, if there is one, is precisely the opposite of the one they believe is there. Over the span of these data, there has been a consistently positive--not negative--correlation among the stock market, the economy and the trade deficit. This is just one misconception in a long list of market myths… Do earnings really drive stock prices? Can the FDIC actually protect you? Is portfolio diversification a smart move? Read our free report "Market Myths Exposed" now and find out whether your portfolio is built on flawed foundations. This article was syndicated by Elliott Wave International and was originally published under the headline Falling Trade Deficit is Good for Stocks: True or False?. EWI is the world's largest market forecasting firm. Its staff of full-time analysts led by Chartered Market Technician Robert Prechter provides 24-hour-a-day market analysis to institutional and private investors around the world.